Chiastophyllum is a hardy perennial. 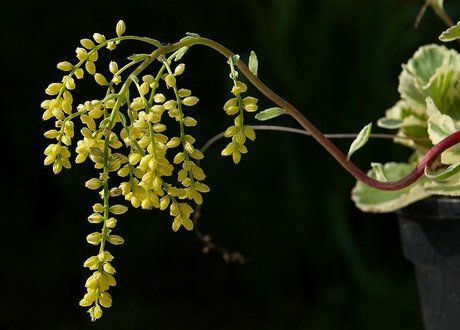 It flowers in the summer with sprays of yellow flowers at the end of wands. It is an ideal plant for growing in rockeries. Common names includeGolden drop and Silver crown. As a member of the Crassulaceae family, Golden drop is closly related to the Sedum plant genera. Common Names: Golden drop, Silver Crown, Lamb’s Tail. Height: 6 to 8 inches (15 to 20 cm). Native: Eastern Europe, Western Asia. Growing Region: Zones 4 to 8. Flower Details: Yellow. Tiny. Dangling racemes. Look like small yellow peas. Foliage: Evergreen. Oval. Curved projections on leaf edges. Sow Outside: Surface. Start of spring - before the last frost, or towards the end of autumn. Spacing 6 inches (15 cm). Sow Inside: Germination time: two weeks to two months. Temperature 70°F (21°C). Mix seeds in a moist growing medium, place in a freezer bag, then stratify by refrigeration for three weeks. Sow stratified seeds about two months in advance. Transplant outdoors following the last frost or in autumn. Requirements: Full sunlight or partial shade. Good drainage. Best results in light, moist soil. Regular watering whilst growing. Avoid watering at other times. Propagate: by taking Chiastophyllum cuttings in middle to late summer, or by dividing in the spring in cooler areas, or autumn elsewhere. Miscellaneous: This plant is often referred to as Umbilicus oppositifolius but is usually classified by itself in the Chiastophyllum genus. If planning to grow Chiastophyllum plants outdoors then they should be planted on the soil surface in early spring before the last frost or towards the end of autumn. Silver crown and other Chiastophyllum should be grown in a sunny part of the garden, though they do well in partly shaded conditions too. The soil should have good drainage but slightly moist in composition. When starting as seedlings first indoor then they should be prepared about two months before they are due to be transplanted outdoors in the middle of spring or in autumn. Seeds should be chilled by placing the seeds (within soil) in a black bag, then placing in the fridge for two weeks. Seeds should then be sown at a temperature of about 22-23 Celsius; they normally take from two to eight weeks to germinate. Chiastophyllum plant seedlings should be planted out with a spacing of around 15 cm. They require watering whilst growing, but can be left dry for the rest of the year. If you require more plants then cuttings can be made towards the end of summer.